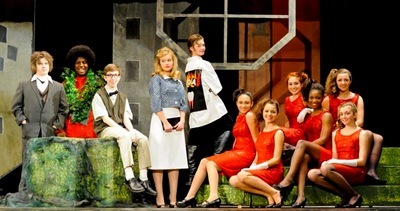 Posted on Thu, Mar 22, 2012 : 5:56 a.m.
Now in their 22nd year, the Tappan Players announce the 2012 performance of award-winning musical "Little Shop of Horrors," by Howard Ashman and Alan Menken. Under the direction of Alex Mendiola and Kathy Kauffmann, the production will feature more than 150 Tappan middle-school students. "Little Shop of Horrors" is a rock musical version of a 1960s B horror movie. It is the story of Seymore, a sensitive botanist, who discovers a mysterious new type of plant, one that has a taste for human blood. Tickets for "Little Shop of Horrors" are available for $10 through showtix4u.com and limited tickets will be available at the door. Show times are Friday, March 23, 7 p.m.; Sat., March 24, 1 p.m.; and Sunday, March 25, at 1 p.m. Shows will take place at Tappan Middle School, 2251 East Stadium. Fri, Mar 23, 2012 : 2:45 a.m. The show is going to rock! The kids are amazing!